Every once and a while, we need the reminder to be still. Encouragement to be quiet. 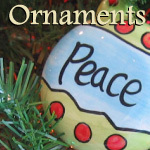 Whether this is a reminder for you, or a chance to celebrate the peacefulness in another's life, this simple "Be Still" ornament is perfect for any occasion. Crafted in pewter; 2" long x 1 1/2".